Welcome to Wayward Pines, the last town. Secret Service agent Ethan Burke arrived in Wayward Pines, Idaho, three weeks ago. In this town, people are told who to marry, where to live, where to work. Their children are taught that David Pilcher, the town’s creator, is god. No one is allowed to leave; even asking questions can get you killed. But Ethan has discovered the astonishing secret of what lies beyond the electrified fence that surrounds Wayward Pines and protects it from the terrifying world beyond. It is a secret that has the entire population completely under the control of a madman and his army of followers, a secret that is about to come storming through the fence to wipe out this last, fragile remnant of humanity. This was the third book in the Wayward Pines series, and I’m hoping it won’t be the last. I reviewed the second book last summer and since this is going to be a mini-series on Fox this summer, you need to start reading to be caught up in time! All three books in this series were engrossing, but I especially struggled to find a good stopping place with this one. Without giving anything away, I felt like the characters were up against a wall and had little to no option in their situation. I was anxious to see what they would do and found myself reading into the early morning hours to discover their fate. Although the primary antagonist(s) is obvious, lines become blurred as the story continues, with some characters questioning their own motives. I liked that aspect because there are shades of gray in everything and it made for better characterization. It also made me wonder what I would do in the same situation. The plot twist at the end left my mouth hanging open – I was completely blindsided. The pacing was quick, the characters both likeable and detestable, the action nonstop, and the stakes high – all of which explain why I read this book in less than two days. I would highly recommend this series to sci-fi, fantasy, and thriller lovers. If you haven’t discovered Blake Crouch yet, you’ll probably be hearing a lot more about him after the mini-series this summer. 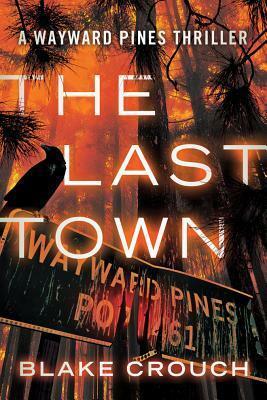 The Last Town is scheduled for publication July 15, 2014. This review is based on a digital ARC from the publisher through NetGalley. Ohhh, it’s going to be a mini-series. I thought it was going to be a regular TV show. Mini-series makes more sense. I need to go read book 2. I just recommended this to you on Goodreads – think you’ll really like it. You write these so well…wish I liked a thriller. I will pass the review on to some, for sure.